Sharrons Event Catering Company’s mission is to be the premier Wedding Catering Company for wedding day food and wedding planning in your area. We specialize in wedding catering and wedding planning for all of London and the south east of England including, Essex, Hertfordshire, Kent and surrounding areas. 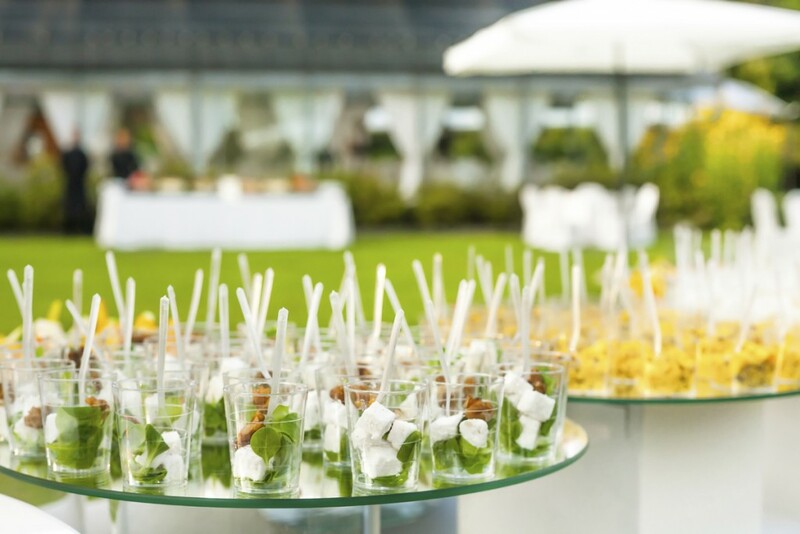 Over time we have gained extensive experience in wedding catering and work with a wide range of products and services to help your wedding celebration run smoothly and to plan. We have researched and sourced the best wedding services to ensure a wonderful event and to give a personal and professional service to all, from conception to completion. If you require your wedding to be a small intimate affair or you require your wedding to be a grandiose occasion, either way we understand your wedding will require careful planning and co-ordination. Our capable events team can look after all aspects of each event, from suggesting examples of wedding food and hand picking the perfect waiting staff, to matching table linen with flowers, organizing the music, entertainment and decoration. In fact we can assist you in all aspects of your wedding catering and your wedding day planning. Our aim is to take the stress out of organising your wedding catering and wedding planning. We want to provide you with the peace of mind that enables you to relax and enjoy your big day as much as your guests secure in the knowledge that through our meticulous attention to detail, creativity and passion, your wedding will be a day to remember for the rest of your life. We can welcome your guests to your venues with a selection of wonderful drinks receptions which include Champagne, Bucks Fizz, Pimm’s, Rum punch, Tea & Coffee or drink of your choice with a delicious accompaniment of scrumptious hot and cold canapés. Our team takes great pride in contributing to make your wedding even more special. Every wedding is different; we will design and tailor the menus to your requirements. We are happy to offer a formal served reception where our waiting staff will serve the food of your choice to your tables or if you prefer we can offer the less formal buffet reception where your guests will be accompanied to the hot buffet to pick from our extensive range of hot food choices. It is also important for us to consider all the special dietary requirements of your family, friends and guests, we are happy to provide special dietary food as directed. We are passionate about working with local produce and where requested can use foods of providence. We also source many organic foods and would be delighted to discuss any detail of the wedding day catering produce with you. In carefully planning your food for the day, we can work with our local expert partners to select competitively priced wines, champagnes and after dinner drinks that will not only compliment your menu choices, but reflect the overall care and attention that has been given to the day and we do not charge corkage and are happy to pour your own reception drinks, wine at the table and Champagne toast. Over the years our team has built strong relationships with the best wedding service professionals in our area and we are able to recommend these to you with confidence that they will be able to assist us to ensure that your wedding day is perfect in every way. We can also provide an exclusive table decorating service which includes balloons created by our award winning balloon artist. Floral displays, Favours, charms and contemporary place settings. We can also provide a wide range of table centerpieces and colour co-ordinated themes including linen, flowers and lighting to bring out the best of the general ambience of the venue and surrounding areas. If you are planning on having your wedding in London and the south east of England including, Essex, Hertfordshire, Kent and surrounding areas. No matter the size of your wedding reception, how simple or complex your requirement, please do call or email Sharrons Event Catering Company’s friendly event team to discuss your needs. Visit our testimonials page to see out what our clients are saying about us.